Arnold Mitchell (1929-2014) played in every position for Exeter City, including a stint in goal, but he was best known for his defensive roles. He made 495 League appearances and scored 44 goals, making him City's all time record appearance holder. 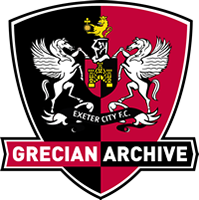 He was a member of the Exeter team that won promotion for the first time in the club's history in 1964. Julie Mitchell and David Mitchell, Arnold's wife and son, offered a number of items for digitisation. This archive includes an interview with David Mitchell, conducted in 2015 as part of Grand Challenge run by University of Exeter.